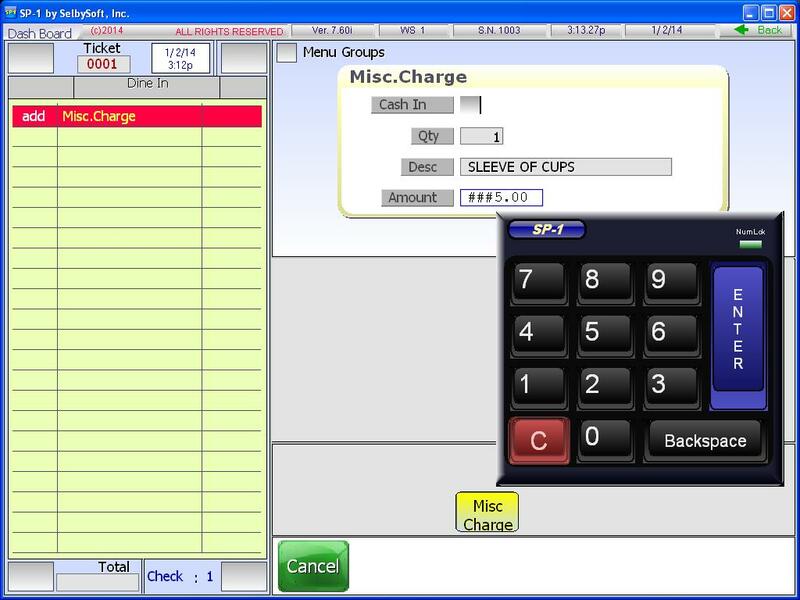 Our SP-1 by SelbySoft POS has a lot of features. I thought it might be a good idea to cover three reporting figures your coffee shop manager should be looking at. The great thing is that all three of these are instantly accessible from the Business Summary Recap. Labor. 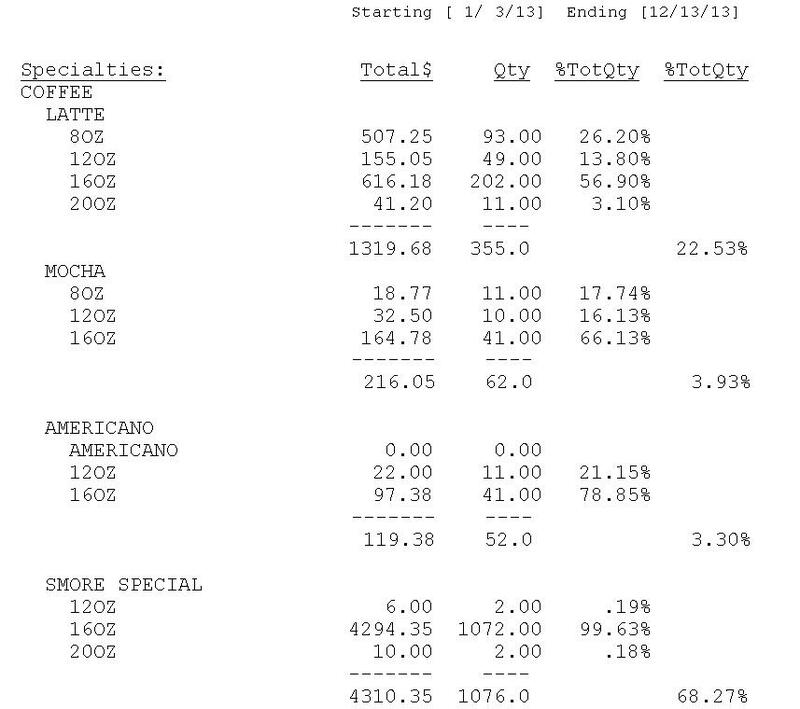 The Business Summary shows both the labor percent and labor dollars. This is a great way for your manager (or yourself) to stay on top of scheduling employees. Remember, labor is one of the costs you have control over. Gift Card Sales. You definitely don’t want this to slip. SP-1 by SelbySoft will provide a total dollar amount of gift cards sold. You can even check this number throughout the day to see how different shifts are doing. Voided Tickets. This is a great indicator of potential problems in the store. Any exceptions to the norm should be investigated to insure there was no theft! 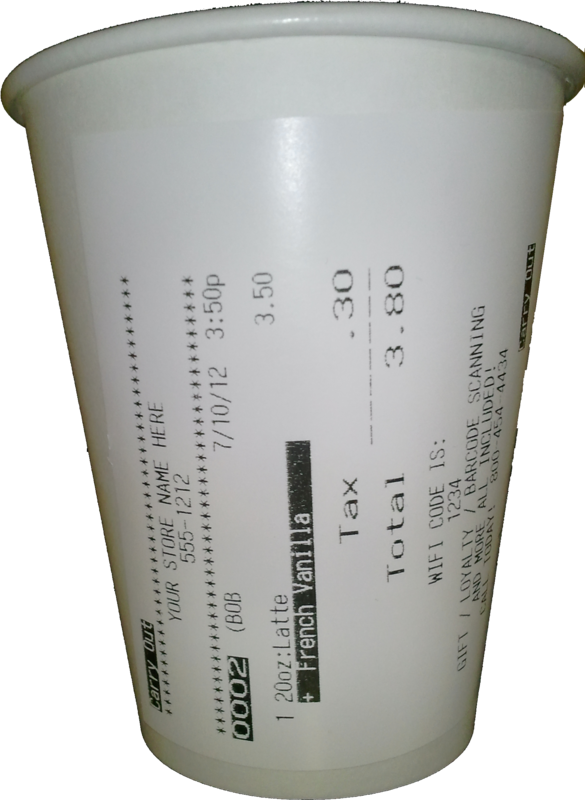 Below is an example of the sticky receipt printing that SelbySoft has available. This paper (and printer) is liner less (no backing) and leaves no residue. This is a great way to avoid writing on the cup and can help customers identify their drink quickly when placed on the counter. 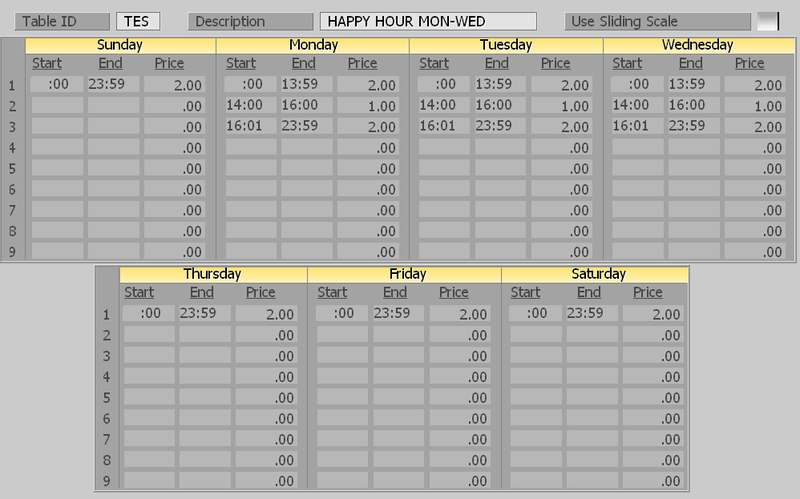 In today’s post, we will be looking at how to create a price table that is day and time dependent. This could be for happy hour, a specific day promotion or to boost sales during a time of day. Price tables make this really easy to do. Sunday, Thursday, Friday and Saturday – $2.00 all day. Monday, Tuesday and Wednesday – $2.00 from midnight to 1:59pm. $1.00 from 2pm to 4pm and then back to $1.00 from 4:01pm to midnight. Recently, we made some changes to how our barista and kitchen monitor system works. The first change regards forced modifiers. 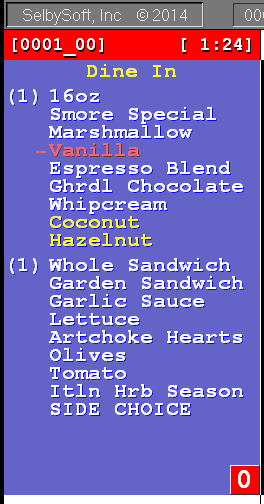 For those of you that are not printing the standard specialty ingredients, we are now showing the forced modifiers. We are also now highlighting any additions to standard specialty items. I know that security is never fun to talk about. People hate thinking about theft. So let’s call this a conversation about ‘preventative maintenance’ instead. 1. Don’t have the same employee code for everyone. Have the employees use an individual code for clocking in and for taking orders. It does not take much to setup and it’s not that hard for employees to get. 2. Go through your security settings and make sure that employees don’t have the ability to re-open tickets or void tickets once completed. While you are at it, make sure it takes a level 9 security to change security levels! 3. Check that you don’t have any 100% or open discounts without security. If you do, place a manager or owner level security on them. 4. Don’t let employees open the cash drawer with a key. It only leads to problems with the cash. 5. Check your audit reports as well as your employee summary report every once in a while. When employees know you are on top of things, they are less likely to try and steal. There you go, five short, easy methods of security that you can implement. 520 tickets on average in a thermal roll. 220 feet of paper. 396 tickets on average in a plain paper roll. 165 feet of paper. The order can’t be dropped or lost. If it is marked done, it can be undone. 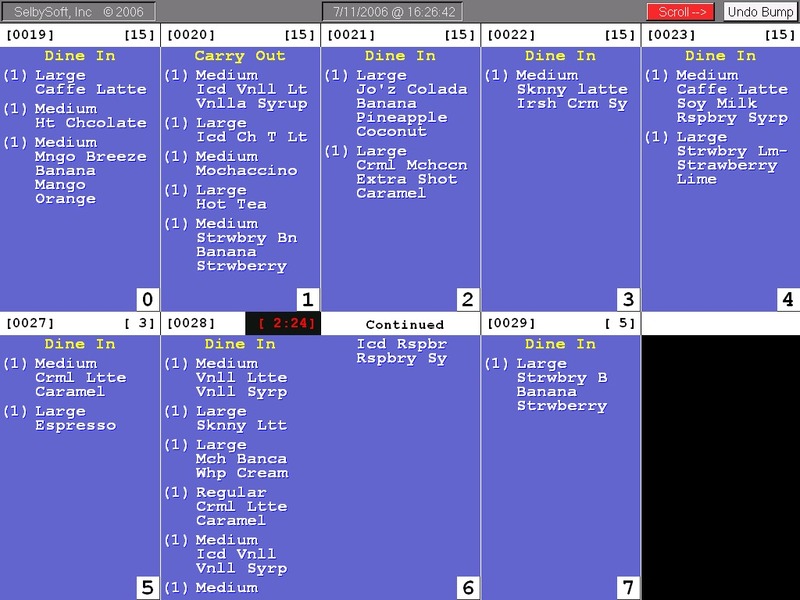 You can see up to ten orders on the screen at a time. You can easily break up by category or by order type. You can set a timer for when the order has been sitting too long.